Choose those that are hard, yet sufficiently ripe, cut away the leaves and stalks. Set on a stewpan half full of water, salted in proportion of a quarter of a pound of salt to a quart of water; throw in the cauliflower, and let it heat gradually; when it boils take it up with a spoon full of holes, and spread them on a cloth to dry before the fire, for twenty-four hours at least; when quite dry, put them, piece by piece, into jars or glass tie-overs, and cover them with the pickle we have directed for beet roots, or make a pickle by infusing three ounces of the curry powder for three days in a quart of vinegar by the side of the fire. Nasturtiums are excellent prepared as above. Image: James Peale. 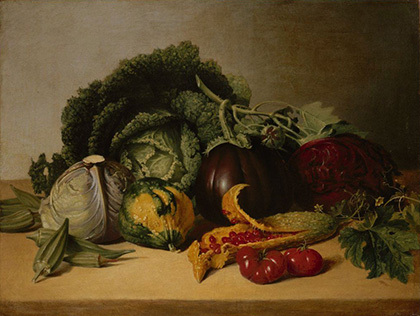 Still Life: Balsam Apple and Vegetables, c. 1820s. Lent by the Metropolitan Museum of Art, Maria DeWitt Jesup Fund, 1939 (39.52).